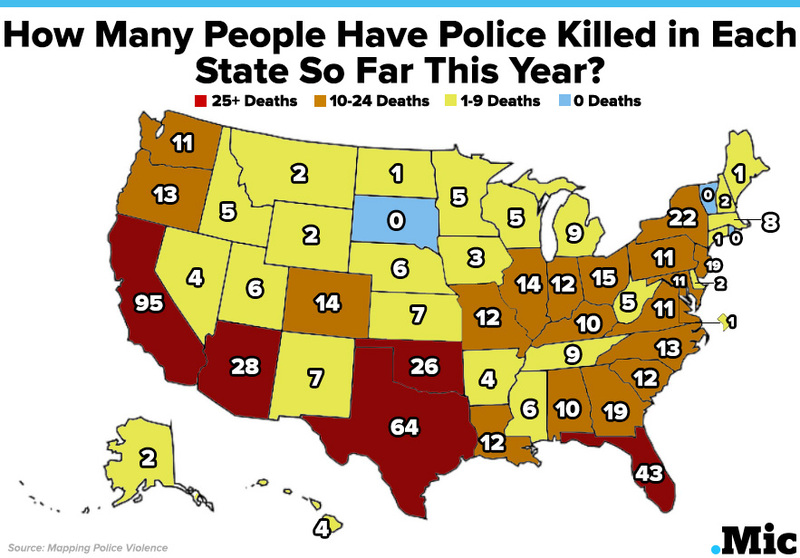 Mic.Com reports that in 47 out of 50 states, American police officers have killed at least one person so far this year. In some states, the number of officer-involved homicides dwarfs numbers from entire countries. The map below shows data compiled by collaborative organization, Mapping Police Violence, which aims to quantify the impact of police violence on communities. So far, there have been 605 deaths from police violence in the United States from January 1 and July 10 this year. Last year, in 2014, there were at least 304 African Americans killed by police in the United States. Of those 304, 100 were unarmed black men. Click here to see reports from previous months in 2015. Killer Cops Never Have To Pay!